Life around here can get pretty hectic and full. With 2 kids and 2 adults, there is always something going on. Even though we all get busy around here, it is important to me that we still eat REAL, unprocessed foods. And this takes time. Planning ahead a bit and spending a little time prepping food each week saves me a ton of time in the long run. 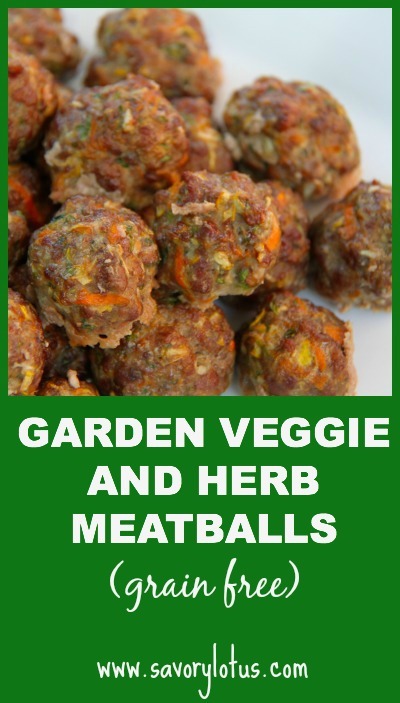 This week, I made a huge batch of Garden Veggie and Herb Meatballs. 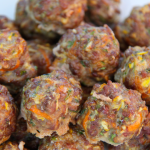 Meatballs are an simple way to get nutrient-dense food into your family. They are easy to make, freeze really well, and everyone around here loves them. I like to make a big batch and freeze them for fast dinners later on. It’s awesome to have food ready to go, especially on those days when you just can’t seem to find the time to prepare food. Meatballs can be made from any meat that you wish. I used local, grass fed beef. We bought part of a cow this year so there is lots of it in the freezer. I highly recommend buying meats that are humanely-raised and pastured. 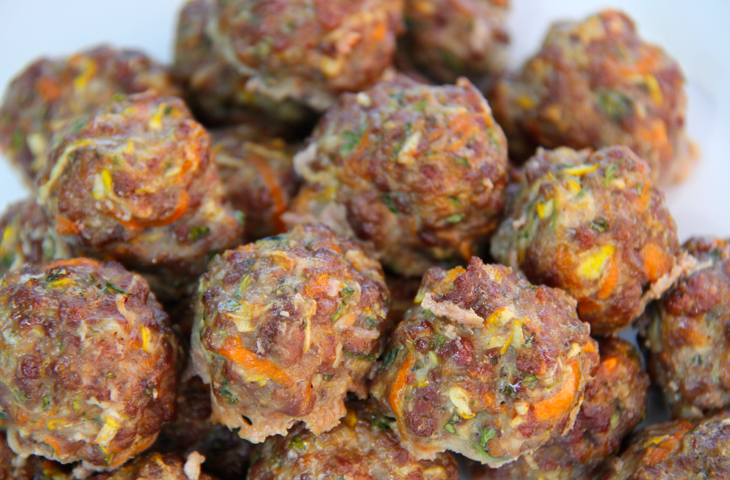 These meatballs were inspired by the bounty of vegetables and herbs in the garden. Why not add a little bit of vegetables to go with the meat? It’s like having a full meal all in one. I pop a few of these in my mouth right out of the fridge when I am super busy. And they make an excellent on the go snack. My little one happily munched on a few of these today while I shopped for groceries. Like I said before, these meatballs freeze really well. So feel free to double or triple this recipe. 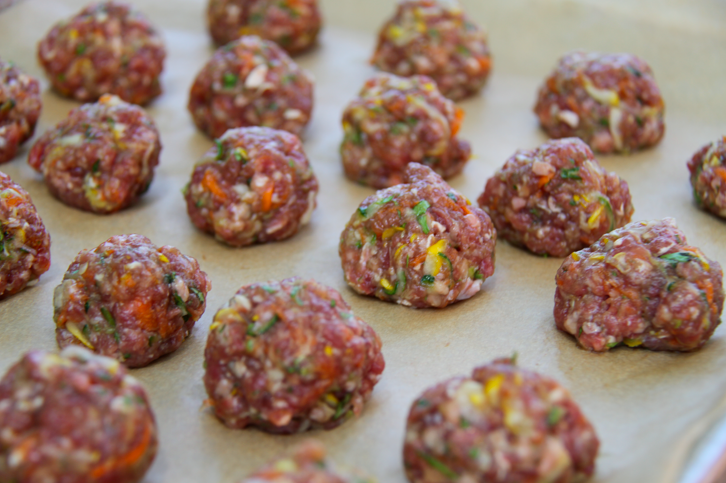 Simply allow meatballs to cool completely, place in freezer single layer on a baking sheet until completely frozen, and then store in an airtight container until ready to use. Place shredded vegetables into a colander in the sink. Sprinkle with 2 pinches of sea salt and mix well. Allow to sit for 10 minutes. Then place veggies into a clean hand towel and SQUEEZE out all of the moisture in them. Set aside. Meanwhile, puree onion and garlic together in a small food processor. This recipe looks delicious! Have you ever made it with ground turkey instead of beef? Thanks! I haven’t but I bet if you used dark meat turkey, it would be tasty. Let me know if you try it. I have so much beef in my freezer for a 1/4 cow that we bought that beef is what I’m using right now. yes but I bet its better for you with the gf beef, looks delish n cant wait to try them, usually I use some pecorino romano too. yum yum thanks!!!! I made them with ground turkey last night and they were a huge success. 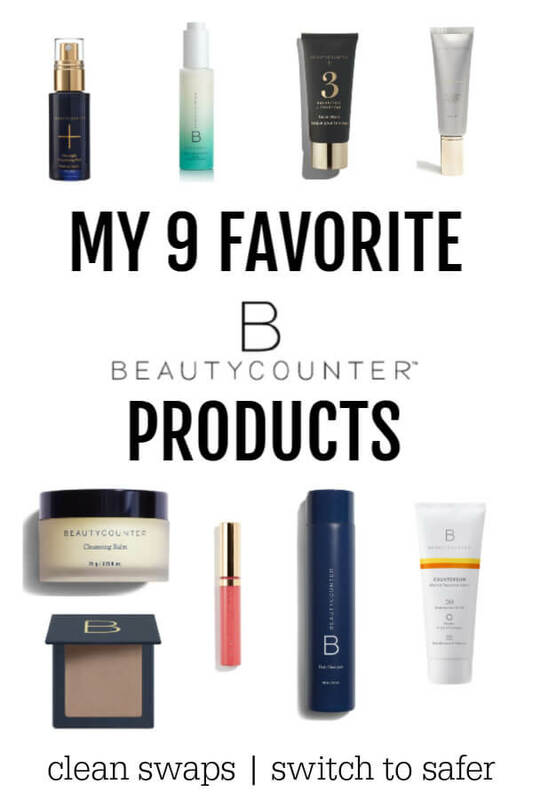 My husband absolutely loved them. 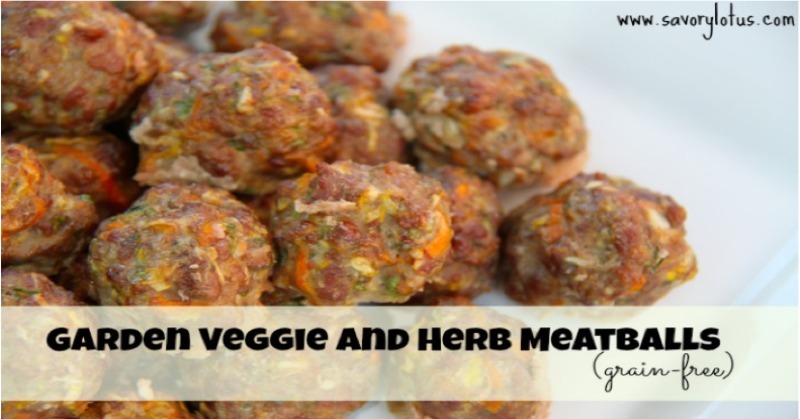 It’s normally difficult to get him to eat enough veggies so these are a great solution. Thanks for the wonderful recipe! I just made this with ground turkey for dinner tonight and they were fantastic!!!! Even our four yr old guest who is used a very different diet said yum and asked for seconds!!! yay! Thanks for the great feedback! I think I need to make these again soon too. Thanks for coming by! What a great way to sneak extra veggies into your meal! This would be a hit with kids for sure, not to mention adults! Yum! My kids love these. They make great snacks for on the go. Thanks for coming by. These look so good! Thanks for the recipe. (I’m gonna tweet and pin) Have a lovely day! I don’t eat beef, but I bet my kids/husband would love these! You are welcome. Thanks for coming by. I would love to be able to pin your recipes! They are all so delicious! Unfortunately, I can’t print so they often get lost in the shuffle. G’day! 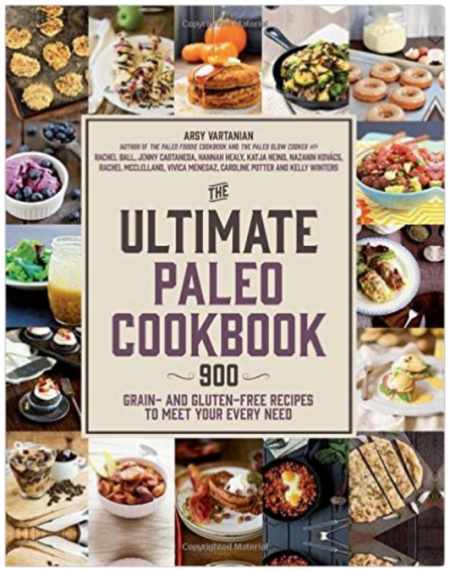 Thank you for inspiring me to create an adapted recipe based on my food lifestyle! thanks so much for sharing! so awesome! Recipe is super delicious. I used the veggie bits leftover from my morning green juice. The meatballs were tender, moist and full of flavor. I think that the veggie bits (insoluble fiber) have basically replaced bread crumbs to keep the meat together. Thanks! Yay! I am so glad that you like them. Thanks for stopping by to leave your feedback! oh wow, refreshing recipe! can’t wait to try something without grains, or beans, or dairy! !